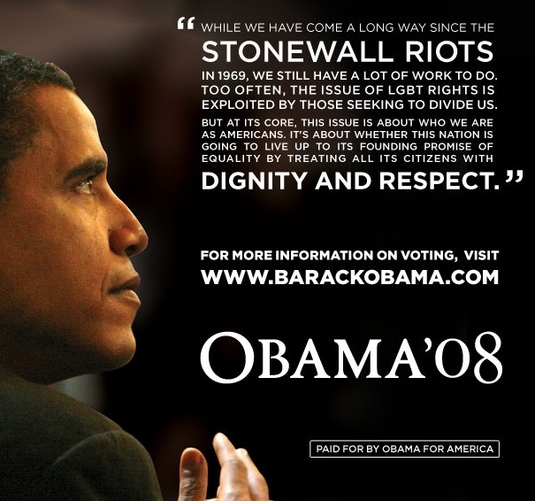 During his Presidential Campaign he courted the Gay Community and spoke of the inequality shown us by the military. He made a promise. He said over and over again that he would repeal Don’t Ask Don’t Tell. He spoke of how the Black Community had struggled against discrimination for generations. He compared the discrimination Blacks had endured for generations to the discrimination Gays have endure – well – for thousands of years. He spoke of the America where all citizens are equal and free to pursue happiness. The Gay Community overwhelmingly supported him in his campaign. The Gay Community voted for him en masse. The Gay Community believed his promises. The Gay Community believe he offered the “Change We Need”. The Gay Community had such high hopes after he won the Presidency with an overwhelming landslide. The Gay Community believed America’s attitude towards us had changed for the better. The Gay Community thought their time had come and their Civil Rights were about to be recognized just as the Black Community – with our support – had been recognized as equals and their Civil Rights guaranteed. Obama spoke of the Black Community’s Civil Rights movement and how Harry Truman’s Executive Order that repealed segregation in the Military had been the catalyst for the future Civil Rights movement. He noted that Truman’s courage to do “What was right” set events in motion that could not be stopped. He spoke of how that moment in time was pivotal and that Truman should be remembered for the stroke of his pen that ended the discrimination Blacks had suffered. I remember watching Obama make his acceptance speech when he won the Primaries as he spoke to that crowd of 100,000 in Chicago and untold millions on television. 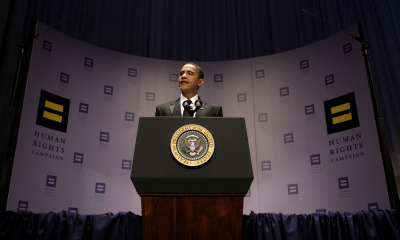 I remember Obama spoke of the rights of the Gay Community during that speech. It was awe inspiring. I thought that was a pivotal moment in our struggle for Civil Rights. Obama took office in January, 2009 with a Democratically controlled Congress. He had an initial approval rating over 80%. At that moment in time he could have put us at the forefront of his administrations agenda. He could have submitted to Congress legislation to repeal DADT and it would have been passed without hesitation. He had the power to help us then but he waited. He never even spoke of it again until recently. Gay rights activists have been persistent and asked over and over again about when he could do as he promised and help us end DADT. Recently – now that his ratings have crashed through the cellar – he decided it was time to help us. Now that he couldn’t get Congress to pass time of day for him. Now that he needs us to help him improve his ratings he decides to put on a Grand Show of it. The Military Spending Bill that was defeated in the Senate today died because of the amendment included in it that did not actually repeal DADT, it did not actually set a time table for the repeal, it simply instructed the military to do more “studies” about the possibility of repealing DADT. WHAT? That’s right – the mere suggestion caused those brave Democratic Senators to throw us out like so much garbage. After all, it’s an election year and they can’t risk their careers for our civil rights. Obama knew what the outcome would be but he wanted to use us again. Perhaps Harry Truman should have taken on the challenge of helping the Gay Community instead of the Black Community. I wonder how Black Americans would feel if they were in our shoes watching as these greedy, slimy politicians stab them in the back over and over. Perhaps Obama would not even be allowed to drink water from the same fountains as Gay Americans. How would he feel? Perhaps Martin Luther King should have marched to Washington, D.C. demanding Civil Rights for ALL Americans – oh, wait a minute – HE DID!!! Martin Luther King did call for Civil Rights for all Americans – we are part of the “All Americans” group. How could Obama forsake us this way? How could he lie to our faces and promise us we would be as equal as Black Americans? How could he ignore our pleas for mercy with a clear conscience? How can he sleep at night? If I could go back to that night when I watched him with so many millions of other Gay Men as he made that promise to us now that I know he is just as slimy as the rest of those slime balls that America voted into office maybe my hopes would not feel so betrayed tonight. Obama has betrayed the weakest minority in America – I hope he is proud. I hope his family is proud of him for betraying us. I’m sure the hate mongers and homophobes of this country are proud of him. After all, that is who he has made happy with this betrayal. Leave it to Lady Gaga to make sure the 2010 MTV VMA Awards got off to a fashion-forward start-the new Queen of Pop brought a new look to the red carpet and, of course, a touch of political controversy. The inimitable Lady Gaga arrived in a dress by the late Alexander McQueen: the flowing regal gown wrapped her body in royal shades of gold, dark reds and deep greens. The whole look brought to mind a medieval monarch — only most ancient queens didn’t wear metallic golden feathers on their heads that looked like a Mohawk crossed with a Trojan helmet of war. Naturally, like any royalty worth her weight in gold, Gaga arrived with military protectors. In Gaga’s case, her Ladyship was flanked by servicemen and servicewomen who had been discharged from the military for refusing to go along with the US’ controversial “don’t ask, don’t tell” policy. Gaga even directly dissed the policy in her red carpet interview and vocalized her support for SDN.org, a 17-year-old organization formed in reaction to DADT policies. All in all, Gaga’s unforgettable entrance brought to mind her “Alejandro” video by combining commentary about gays in the military with religious iconography. The religious element to Gaga’s dress was less noticeable but still present-there appeared to be the face of a saint sewn onto the décolletage of her dress, bringing to mind Renaissance-era religious paintings.